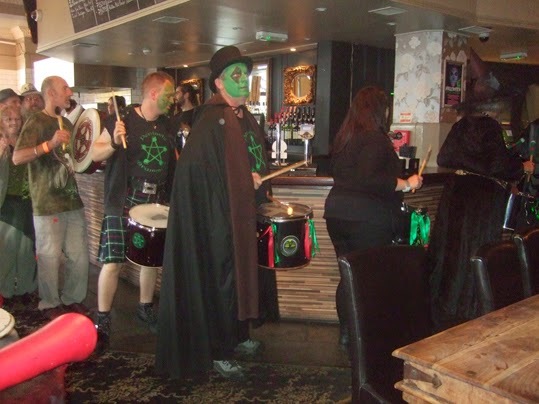 The photo above shows the drumout at Pagan Future Fests' Samhain celebration last Sunday. Every who came to the event was invited to bring a drum and join in with a drumming procession around the building - inside and out - to raise energy. It looked great fun. I would possibly have joined in except that I don't own a drum. I had one once, but a dog ate it at a pagan camp a few summers ago. I realise that sounds about as likely as dog eating anyone's homework, but it is true. Maybe there was a lesson to be learnt from it somewhere - perhaps that I needed a better drum. Actually, two of the activities at last weekend's Samhain festival made me want to get a new drum. The first was the drumout and the second was a workshop on shamanism by Artura, in which he demonstrated his drum and the way it was used as a "horse" for shamanic journeying. He also explained how he made his drum and got me thinking that perhaps I should try to make my next one too rather than just buy something ready made. The entire festival was really enjoyable with lots going on and the venue was superb. It was at The Bedford Pub/Theatre, in Balham, which has an amazing round Shakespearean-style theatre next to the large main bar. As well as live music in the theatre there were talks and workshops in an upstairs room and another hall of stalls selling lovely things and people giving Tarot readings. Being at a pub, the bar was open throughout and it also served good food, including rather nice veggie burgers. I met up with several lovely friends and had a great time. Mind you, although the festival was sufficiently well attended to be friendly, I expect the organisers were hoping a few more people had bought tickets. More seats could have been filled at at least one of the talks I went to - a fascinating look at Frau Holle, Frau Perchte, winter traditions and carnival, by Hildegard Maier. If you didn't go to this Samhain festival, make a point of buying a ticket next time Pagan Future Fests organises an event - you'll enjoy it.